As animal lovers, we love and cherish ALL our pets. But certain dogs (and cats) change us – they get under our skin, running through our veins and hearts, and our spirits are forever bound. Heart dogs enter our lives in unexpected and wonderful ways. Our time together is often brief, but the collective impact of our love is mighty and great. They shape our lives and lead us to places we never could have imagined. Sometimes they don’t make it very far and we must continue on alone. But they live on in our hearts and we see the world differently, more vividly and clearly because of the bond we shared. Corbin was Jen’s heart dog. Corbin had already been adopted and returned twice when Jenn and Adam brought him home as a foster dog. Prior to Corbin, Jenn knew very little about Pit bulls other than what was portrayed in the media, and admits she was hesitant. But he quickly won her over with his charm and snuggles and two months after bringing him home, they officially adopted him. Corbin wasn’t always an easy dog. He had some ongoing health issues and a month after adoption, showed some signs of being overly protective and slightly aggressive. Jenn immediately hired a trainer who worked with them in their home providing the tools and guidance they needed to help Corbin reach his true potential as a well-mannered dog. Corbin later went on to pass Canine Good Citizen test. Jenn documented their journey together through her blog. Sadly, Corbin passed unexpectedly in June 2015 just over six years after he arrived. Their time together was all too brief, but through their bond, they opened hearts and changed public perception of Pit bulls and rescue dogs in general. Additionally, they also fostered and re-homed over forty other dogs – many of them pit and pit mixes. One of the dogs they rescued and saved together is Diamond. Jenn discovered Diamond by accident on a Facebook post. 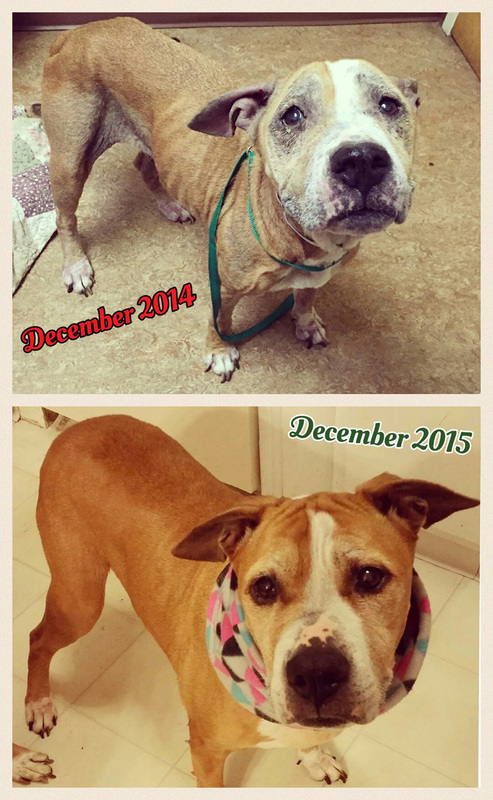 She was an abandoned, senior Pit mix on the euthanasia list at a New York City shelter. Although she wasn’t looking for another foster dog, there was something in Diamond’s eyes that pushed her into action. She contacted The Mr. Moe Project, an organization that fights to save senior dogs in shelters nationwide. After speaking with Chris Hughs, the co-founder, the wheels were in motion and Diamond was transferred directly to a veterinarian for emergency medical care. Diamond was in rough shape. She was suffering from malnutrition, mange, kennel cough as well as ear and eye infections. But in spite of her fragile condition, Diamond immediately wrapped her paws lovingly around Jenn’s waist and she knew she was making the right decision. Once Diamond was strong enough to leave the hospital, Jenn brought her home as a foster dog through The Mr. Moe Project. They soon realized that in addition to allergies and a host of other medical issues, she was also deaf. A few months later, she underwent surgery to remove four mammary masses. Although Diamond wasn’t initially fond of Corbin, he remained at her side during her recovery. After she healed, their relationship changed from fear to love. 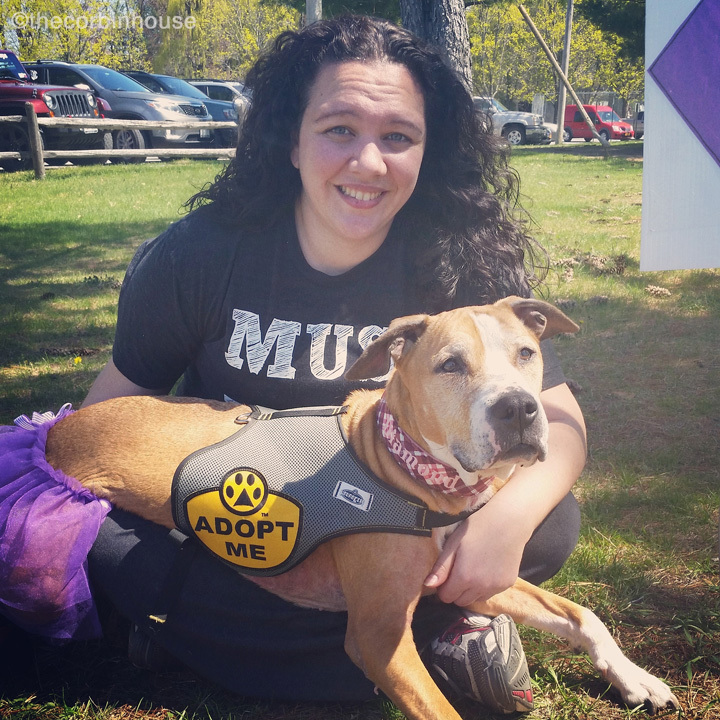 In addition to Diamond, Jenn and Adam share their home with another rescued pit named Amelia as well as two other Mr. Moe Project foster dogs, Emily and Eddie. I know Corbin would be so proud! Diamond is part of The Specials, an award-winning blog series focusing on special needs pet adoption. Senior pets, those with chronic medical issues, behavioral or temperament concerns as well as overlooked or misunderstood breeds like Pits and black cats. If not for the courage and compassion of their adopters, many of these animals might have been euthanized in shelters or died alone and hungry on the streets. You can read more special needs adoption posts here. That would be especially good for elderly people ! I don't believe that a dog is aggressive and bad unless he has a brain damage. It's the owners who makes them bad. I follow Corbin's blog and facebook page. Somehow I missed that Diamond was deaf though. Jenn is a true hero. Jenn is indeed a hero to show such compassion and love to dogs often thought of as too difficult. We need more Jenns (and Adams). Toodle pip!Bertie. What a wonderful story you've told here. I have such a fondness for senior animals, and much respect for those who adopt them. I'll never get tired of reading these The Specials posts. Thank you for doing this wonderful series! I cried all the way through this post. such a wonderful happy/sad story. All 4 of our dogs have been rescues and God bless all who rescue senior dogs.. This comment makes me cry every time I read it. Thank you, Cecilia! This is such a great story. So sad how often these amazing dogs get over looked when people are adopting a new dog. This one got me. Jenn has such a ginormous heart and I've always enjoyed reading about the dogs that they foster. Corbin always made me smile and he still does because Jenn keeps his story and memory alive! Great post. There are lots of senior pets who don't fall into the special needs category, too there big issue is age.One thing I will say is while many of these stories break your heart one of the reasons so many of these dogs get returned is that people act with heart and not head. You need to have compassion and the resources and abilities to deal with the issues you are taking on to manage the challenges. It isn't heartless to say I can do X but Y is beyond my abilities to manage. It's fair to the dog and to yourself. It if far more cruel to lie and say sure we can take this dog only to realize no you can't. That is a great story and thanks to Jenn for saving all those dogs. What a great thing to do. We know thee dogs appreciated it. We sure appreciate all that she has done. We think people like Jenn are truly wonderful people to do what they do!! Seniors both cats and dogs make great pets! We miss Corbin…such a character. 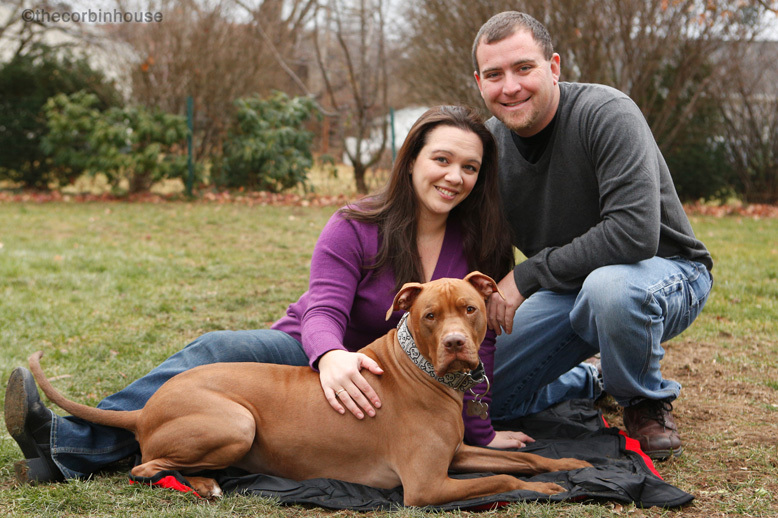 We know how wonderful his family is, to help dogs find new homes and educate people about pitbulls. Thank cod for humans like Jenn. What a great story and I know it will make people think. No matter how old we are we still need love.Ziggy out!! Seniors can make the BEST pets!! Thanks for the birthday wishes!! Inspirational… Jenn, Adam, and Corbin forged the way together. They, including Corbin, are still teaching us all. We adopted a 10 yr old yellow lab years ago, and we'll do it again when the time is right. Fabulous post! And beautiful dogs…what a great message to get out there. Love our senior dogs! We're not really in a place to adopt senior pets but I think I'd like to foster them in the future. Love the series! Lovely post. We reluctantly adopted our first bully breed from the local dog pound about 17 years ago, and it changed our lives (hers, too). Our previous dogs had all been small, scruffy terrier mixes, and that's what we were looking for when we visited a number of area dog pounds and shelters. But the local city dog pound volunteers recognized our experience training dogs and brought out a young pit (probably full-bred American Staffordshire) who had had a troubled life. We initially said no, but she touched our hearts and we went back and adopted her. The first year was difficult, but she turned into the warmest, funniest, most enjoyable dog I've ever had. Ten years after we adopted her, she died of cancer. We went right back to same shelter and adopted another pit mix (probably Boxer/pit combination). If anything, she is even sweeter than the first one. Pitties rule! My own rescue dog I got as a puppy 17 years ago. My husband and I know that he is reaching the end of his life; he has heart disease, a mass of benign tumors and is 90% deaf. We have already discussed the fact that we are at the point in our lives where senior adoption has a great deal of appeal. Reading about senior dogs who are turned in after years in a home breaks my heart. Bringing them 'home' with us for their final days will be our mission from here on out. No one – including a dog – should die alone or unloved.